Chitrak is a herb that grows wild in India and has been used by rural and tribal people for hundreds of years as a traditional system of medicine. Chitrak is native to SE Asia. It is a much branched, evergreen shrub that reaches about 6 feet in nature. Dark green leaves are ovate to 6 inches long by half as wide. They are fast growing plants, but their size is easily controlled by pot size and pruning. The flowers are white in showy dense racemes and will flower all year long. Individual flowers are up to ½ inch (a bit more than 1 cm) across. Chitrak needs full sun to partial shade with intermediate to warm temperatures. After flowering, the plants should be cut back to keep them growing vigorously. The fruits are like a small cocklebur with glue on the soft spines and they will stick to anything. The root and root bark and seeds are used medicinally as a stimulant, caustic, digestion, antiseptic, anti-parasitic. 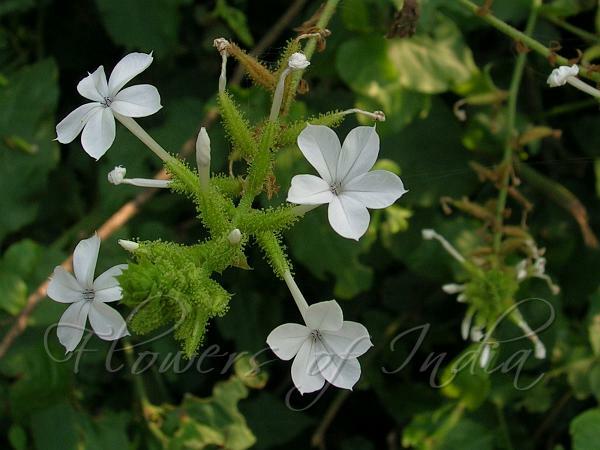 Chitrak is propagated by cuttings, division of older plants or by seed. Medicinal uses: Chitrak is used in treating intestinal troubles, dysentery, leucoderma, inflammation, piles, bronchitis, itching, diseases of the liver, and consumption. The leaves of this herb work well for treating laryngitis, rheumatism, diseases of the spleen, ring worm, scabies, and it acts as an aphrodisiac. A tincture of the root bark is used as an anti-periodic. Chitrak root helps improve digestion and it stimulates the appetite. Chitrak root is also an acro-narcotic poison that can cause an abortion. Identification credit: Navendu Pagé, Vaibhav Photographed in Garden of Five Senses, Delhi.